HPLC Column Chiller/Heater offers programmable operation. Along withÂ 4.0 to 100.0Â°C temperature range that is readable and settable to 0.1Â°C, EchoTherm™ Model CO50Â offers 5-program memory of 10 steps per program and ability to automatically repeat any program from 1–99 times. PID control software regulates temperatures to Â±0.2Â°C, even at ambient. Able to hold columns up to 30 cm long xÂ Â¼ or 3/8 in. diaÂ diameter in provided mounting clips, unit provides such features as RS232 I/O port, injection counter, 30-day timer, and chamber drain. Carlsbad , CA . . . Torrey Pines Scientific, Inc. announces its new EchoTherm™ Model CO50 Programmable HPLC Column Chiller/Heater. The Peltier-based CO50 has 5-program memory of 10 steps per program and the ability to repeat any program from 1 to 99 times automatically. It is ideal for chiral and biomedical chromatography where below ambient temperatures help preserve bioactivity. 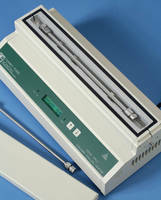 It can be used for stabilizing column temperatures from day to day at or near room temperatures for repeatable results. There is a stable temperature indicator lamp on the front panel of the unit that lights when the target temperature is stable. The CO50 holds columns up to 30cm long by ¼” or 3/8” diameter in mounting clips provided. Larger diameter columns can be used by removing the column clips that hold the smaller columns. The CO50 features RS232 I/O port for controlling the unit by a chromatograph, for programming gradients, and for data collection. Also included are an injection counter, 30-day timer with user settable Auto-Off, and chamber drain for spills. The unit comes with a bench top universal power supply for use anywhere in the world, 3-wire AC line cord for the country of use, twelve month warranty and instruction manual. The Model CO50 is UL, CSA, and CE compliant. Torrey Pines Scientific, Inc., 2713 Loker Avenue West, Carlsbad, CA 92010 USA.